Yahoo! on Tuesday updated its App for iOS without any hype or hoopla. 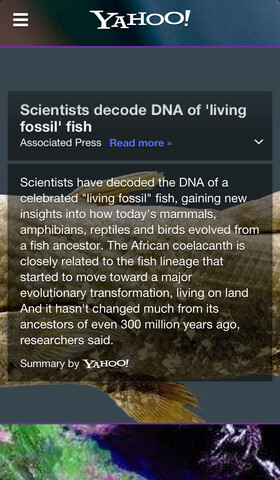 The new Yahoo is version 3.0 and gives you a handsome feast of the latest news as and when it happens. This together with the fact that the App is free is sure to be a must have App for you. As you all recall what happened during the Boston Marathon, it is imperative that you have access to the latest news and Yahoo gives a very good audio visual experience on that front. The Yahoo app is very much focused on news and the latest headlines, bringing more personalization to your news feed, quick summaries for easy reading, and viewer friendly article pages with photo backdrops. Once again I remind you that this App is only for news and only news so don't expect anything other than news from it. Users have the option to view headlines in a clean list as per their preference or choose the default layout. The App also features a visual view of the news. The clean list is great for quickly scanning headlines which you have to pull down to refresh. But by hitting the menu button in the upper left, you can flip a switch to turn the visual news feature on. The brief summaries are made by Summly, a company Yahoo acquired just a month earlier. The app also uses parallax scrolling to make the headlines scroll slightly faster than the background image to give the news feed a feeling of depth. All in all a must have App for iOS devices. If you are interested you can download the App here from Apple Store. If you like this App, get many more iOS Apps from here. Kindly comment in on the App.